Bicycles are a little common and elliptical machines can get mundane. So how about combining the two activities? Meet the ElliptiGO. The ElliptiGO is a hybrid between a bike and elliptical trainer that comes in several models. 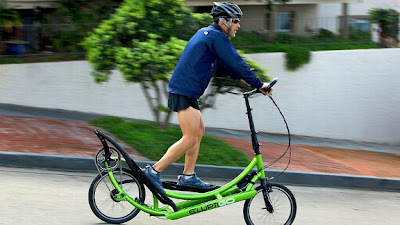 Its creators, two Ironman triathletes, claim that the ElliptiGO burns 33 percent more calories than a bike. And the number of high-level athletes using the device keeps growing.